i'm celebrating! 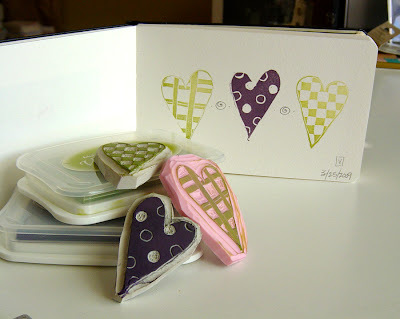 this past weekend i wrote my 200th blog post and reached over 200 "favorite hearts" in my etsy shop! i'm not quite sure how both of these things happened at the same time...all i know is that i think it calls for twice the fun! and what could be more fun than a give-away? 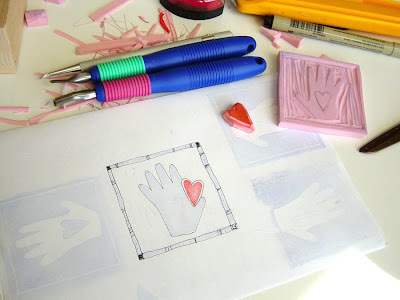 so, give-away #1: i tried to think of a way that i could show you how much i appreciate all of your sweet comments and words of encouragement...especially with my new obsession of carving stamps! 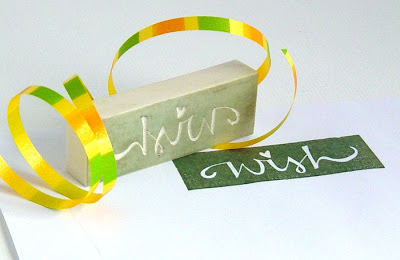 i received so much positive feedback about my "wish" stamp, that i decided to carve another one...just for you (and i think that this one is much better than the first!)! and since we're having twice the fun, we've got to have twice the give-away, don't you think?! 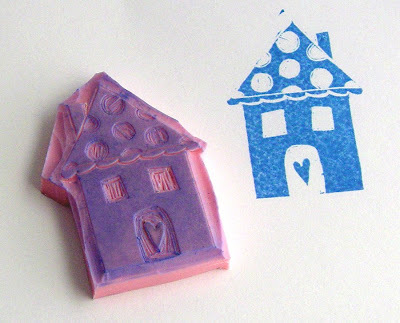 so, give-away #2 is a new stamp that i carved...specifically made for you, my artsy blogger friends! 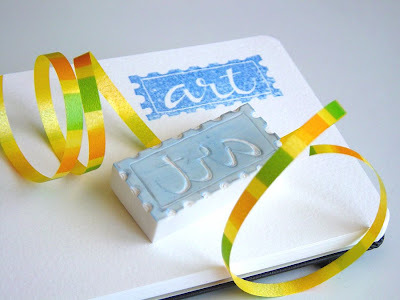 created like the "wish" stamp, i wrote out the word "art", gave it a faux postage stamp border and then carved it into a staedtler mars plastic eraser. if you'd like to participate in this double give-away, just leave a comment before this thursday, midnight, east coast time. 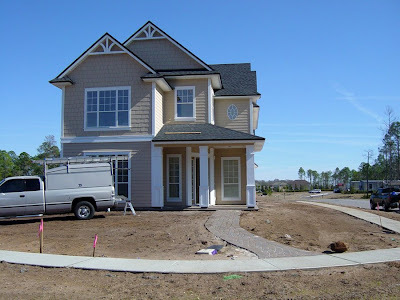 please make sure that i can link back to your blog, or leave your e-mail address so i can contact you. i'll be drawing two names (one for each stamp) and announce the winner on friday! edited: two names have been drawn and will be announced on friday! thanks for helping me celebrate! just wanted to give you a peek at what i've been working on today. i love taking a shape (hearts are my favorite) and playing with different patterns. 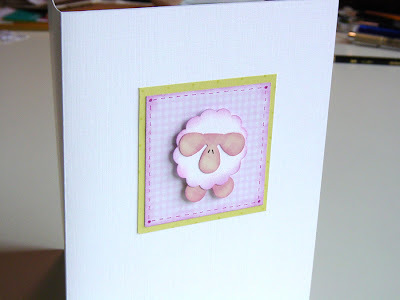 i think that this carved trio looks really cute in my little stamp journal! i hope you have a great weekend! i've got some celebrating planned for monday...maybe even a give-away?! more details coming on monday! see you then! p.s. 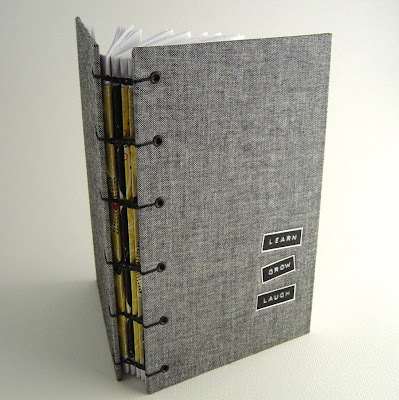 members of the Bookbinding Etsy Street Team have the honor of being interviewed as a way of getting to know each other better. 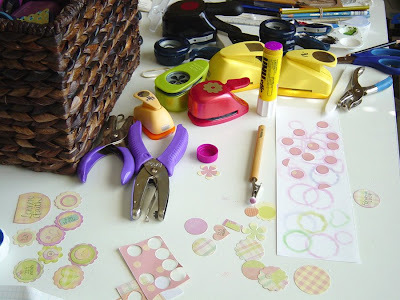 i'm a relatively new member, and you can read my interview here on the BEST blog! the very sweet lauren over at lauren's paint palette gave me this award! admittedly, i don't paint in the traditional sense, but i do have a passion for creating lots of different things using paint! i also definitely have a passion for lauren's paintings! she creates the most beautiful watercolors...please treat yourself and take a peek, you won't be disappointed! thanks so much for thinking of me, lauren...i really appreciate it! i took a stroll through the neighborhood this morning. 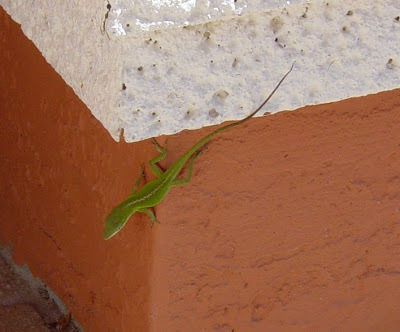 signs of spring are everywhere...like this bright green lizard settling in on our front porch. 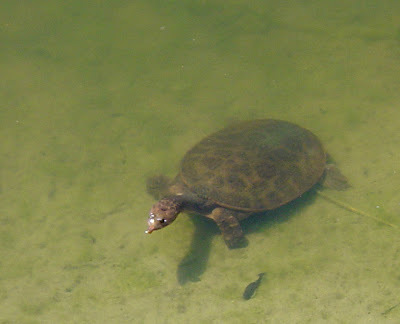 or this turtle swimming in the pond looking for breakfast. 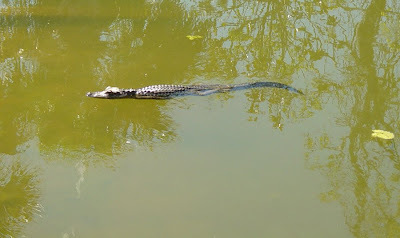 or this baby alligator floating by, uh, also looking for breakfast?! yikes!! 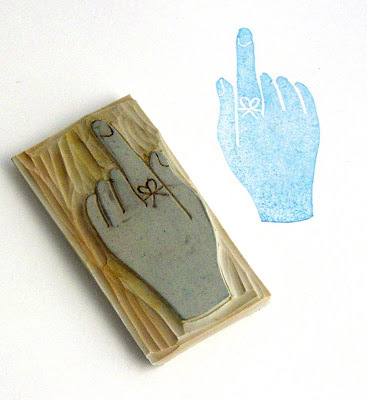 i've been itching to get back to my stamp carving. i'm SO loving it, and kind of wondering how much longer before i go from addiction on into obsession! today i wrote out the word "wish" and started carving away...i'm still very much the beginner, but having oh, so much fun!! i have moved several times in the past few years, and most of my finished projects have ended up in small boxes for safe keeping. yesterday, i opened one of these boxes and found sweet inspiration inside...a prayer journal that i made several years ago! the covers are made of thin sheets of brass metal (to protect the precious prayers inside! 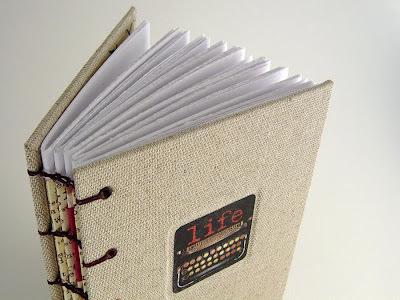 ), and the spine is a piece of brown leather. 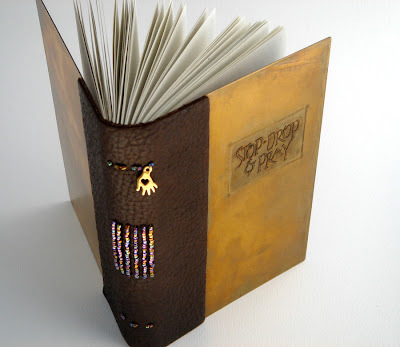 the signatures inside have been sewn using a long-stitch method, and iridescent seed beads were added on the outside of the spine. the title "Stop, Drop & Pray" is the result of taking my original hand lettering and etching it into the metal...a fun process, but you definitely need a special place to do it and a good pair of rubber gloves! you can click on the photo for a larger view...and see more photos of this book here. 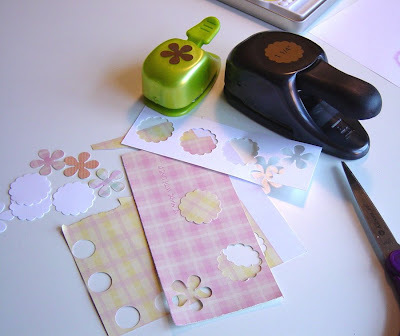 using a scallop-edge punch (mine is 1-1/4") and a flower punch, cut shapes from scrap pieces of paper. 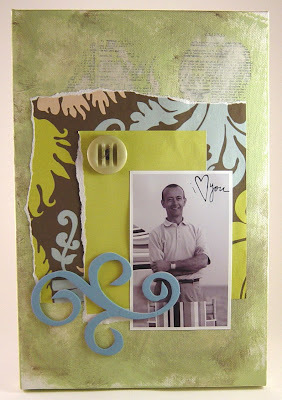 for the body, i like to use a white linen cardstock, and i think it's fun to use patterned paper for the face and legs. there's no right or wrong...just whatever you like the best! 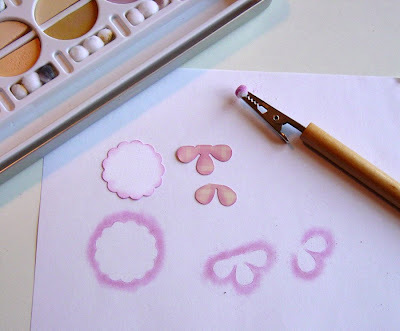 next, cut the flower shape across the middle into two pieces. you'll have one piece with 3 petals and one piece with 2 petals. 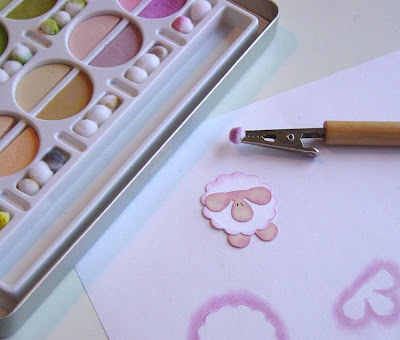 then, i used my pastel chalks to soften the edges a bit. 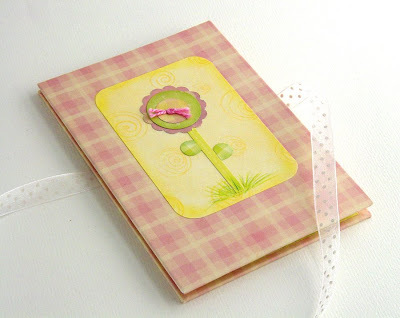 glue the 3-petal piece on top of the scalloped shape, and the 2-petal piece behind the scalloped shape as shown. using a marker, add two eyes...and you're finished! in the midst of a happy flower garden! the lettering was done using my favorite calligraphy nib and gouache. 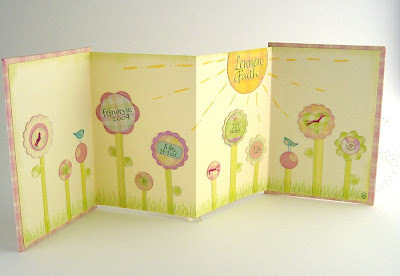 the sunshine, flowers and leaves have been created using paper punched shapes, and i rubbed pastel chalk around the edges. the little birds were just cut from scrap paper and the grass was drawn in using colored pencil. some of the flower centers were sewn using embroidery floss. polka dot chiffon ribbon has been attached to the back of the book and ties in front to keep it closed. and now to clean up...see photo number 1! i just wanted to share with you some of the other treasures that my little dutch boy brought back from japan! 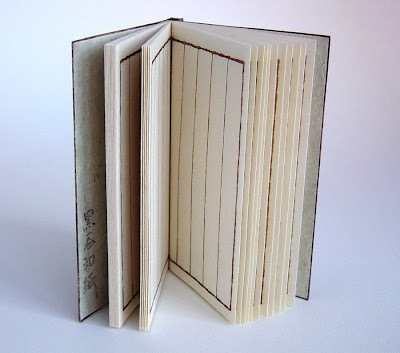 these books have been bound using a four-hole stab binding method and are traditionally finished with a blank title strip on the front for the author to finish himself. at first they looked backwards to me, and then i remembered that the books in japan are opened from left to right, instead of our western way of turning the pages from right to left! the cover papers were handmade by the people who own the shop. i wish you could feel them...they remind me of a flannel shirt that's been washed and then hung to dry on the line outside. they are actually quite soft, with just the right amount of stiffness! 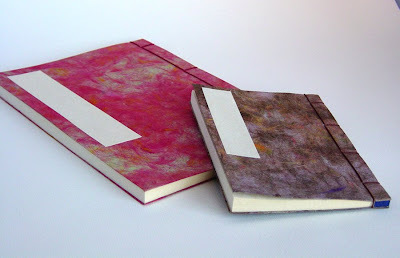 the corners on these books were finished with corner pieces...another part of the traditional binding process. this little brown book is probably my favorite. each page has been lined for the purpose of writing haiku...and it's been signed by the binder on the inside of the back cover! a true masterpiece! i'm still carving up a storm...but kind of getting to the point of not knowing what to carve next! so many choices! today i happened to look over and spy this little house that i made over a year ago using some of the papers in my stash, and i decided to try carving some of my own artwork. so i made a copy of the finished artwork, reduced it, and transfered it to my stamp material. this is the almost-finished-product...i see a few spots that still need to be touched up! my dutch boy and our son just returned home from a two week trip to japan. 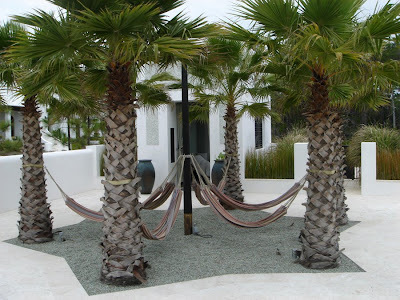 they love to travel there and have made several trips over the past ten years. one year he brought back a simply beautiful heart necklace that has a gorgeous mikimoto pearl dangling from it. he knew that i would love it and he was right! 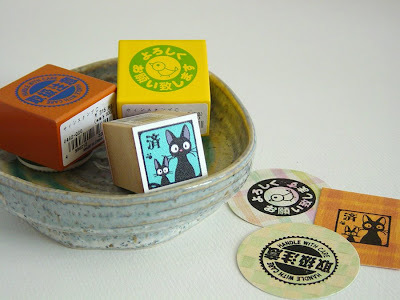 this year he came home with this little treasure: three absolutely adorable rubber stamps. and i must admit that i love these stamps as much as i love my necklace! but, what i'm really loving is the message: this guy knows me...and he knows me well! i would give a week's supply of chocolate to have seen him in a stamp store, in the middle of tokyo, trying to choose the perfect stamps! after twenty-four years of marriage, my little dutch boy still manages to truly surprise, and totally inspire me! 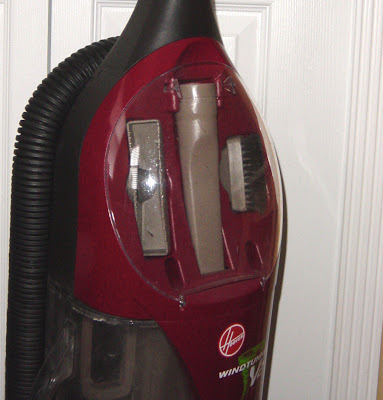 known to most as the "windtunnel deluxe", in our house this fine piece of machinery is fondly referred to as "the lone hoover". oh, it's not his fault that he's lonely. he's good looking and quite friendly...it's just that we really have nothing in common. he's totally focused on cleaning, and, well, i'm not. admittedly, he's always there when i need him (like when the dust bunnies start carrying picket signs and demand better living conditions). i really should try to spend more quality time with him...and, today is the perfect opportunity to do just that. hoover has agreed to help me spruce up the house a bit because my little dutch boy has been in japan for the past two weeks and he's coming home tonight! i wouldn't want him to think that i spent more time playing in my studio than on the housekeeping, would i?! 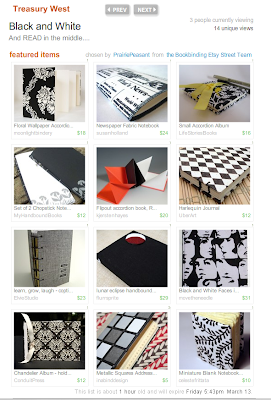 sweet laura over at prairie peasant has put together the most beautiful black and white etsy treasury featuring journals made by members of the Bookbinding Etsy Street Team (BEST)...and she has included the label coptic journal that i posted yesterday! thanks so much laura, it truly is an honor to have been chosen for this! 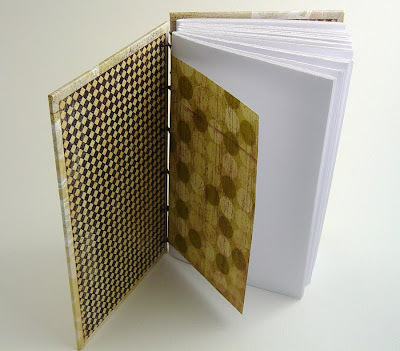 congratulations to all of the talented bookbinders who are showcased here! i was pawing through one of the drawers in my studio several days ago and came upon my dymo label maker. and because i'm always thinking books, books, books, this idea popped into my head! 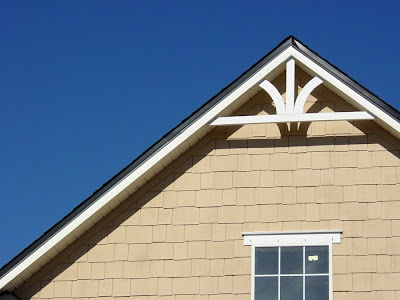 the design is simple. very simple. i hope it's not too simple...sometimes i worry about stuff like that! 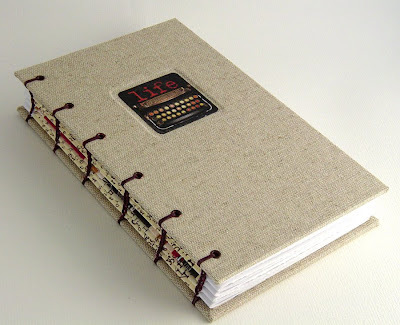 each label has been inset into the cover, and i've used a coptic stitch for the binding. 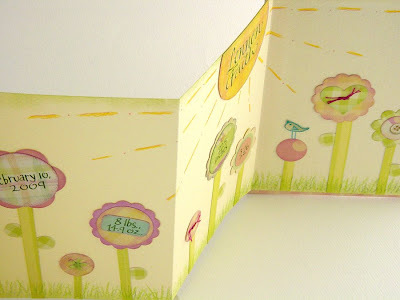 for a peek inside (there's some fun papers hugging the signatures), click here! 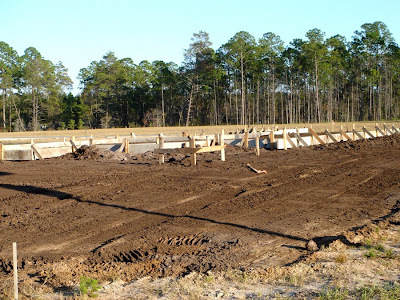 after spending a few days playing hookie, i'm eager to get back to my "wish list" of pending projects. 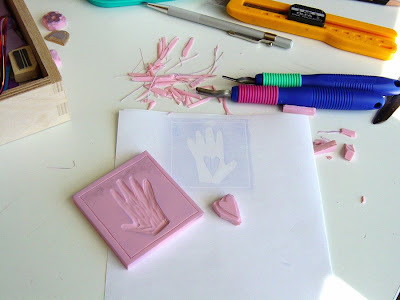 first on the list: carving some more rubber stamps! look familiar? 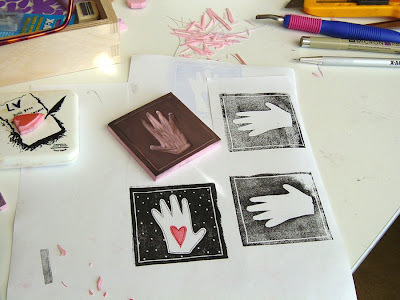 i couldn't resist carving a stamp of one of my most favorite illustrations! i've enhanced the image a little by using a micron pen, and added the white dots with a gel pen. this is the reverse image of the previous stamp. i decided to carve the heart and hand separately, so i can switch the artwork up a bit (sorry this image isn't darker!). this was so much fun...i could easily get hooked on this! our weather here has been picture perfect the past few days...and i must confess that i've been playing hookie in my studio because of it. right now, the fragrance of salty ocean breezes seems so much more appealing to me than the odor of pva glue. 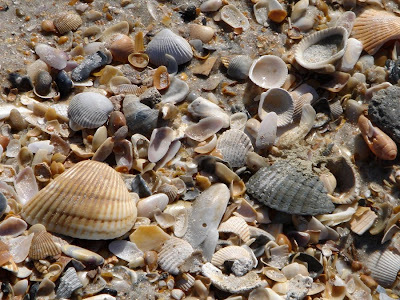 and, if i'm given the choice of staying inside and organizing my paper stash, versus sitting in the sand searching through these broken coquina shells for little treasures...well, you probably already know which one i found to be more inspiring! 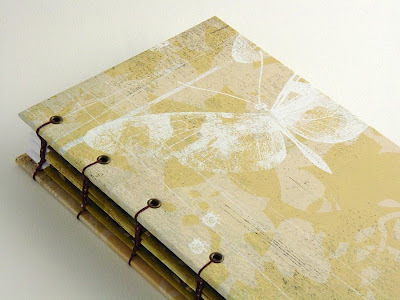 i was instantly drawn to the calmness of this paper...and i'm especially loving that big white butterfly on the front! 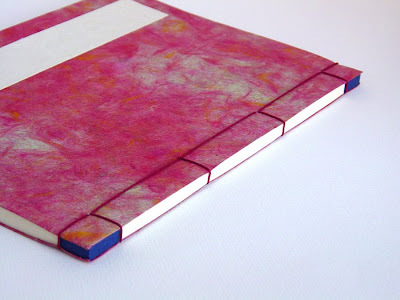 this journal was constructed in the same way as my other recent journals: a coptic binding, with 70 lb. 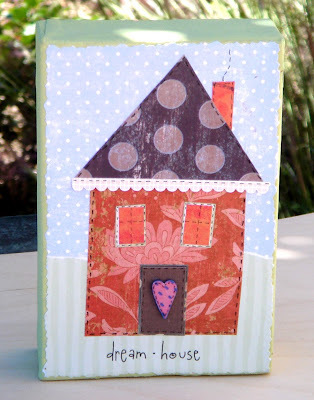 writing paper inside, along with some other coordinating decorative papers. i have some other ideas for switching things up a bit inside. now if i could only find the time to do it all! and here's a tiny peek at the room above the garage...a.k.a. my future studio!! move-in date is sometime in june...am i going to be able to wait that long?! pinch me, i must be dreaming!! we had a little bit of rain and a whole lot of cold over the weekend...perfect weather for putting together some new journals! for this book, i took my cue from the "life" illustration (inset on the front cover), taken from a favorite piece of paper in my beloved stash. the inside is filled with 70 lb. writing paper and decorative type-font-themed papers hug each signature. 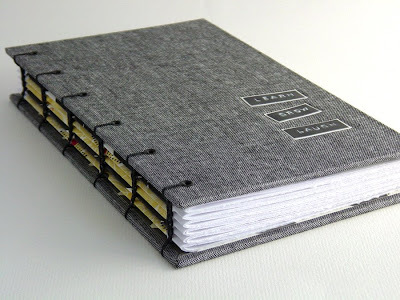 you can see more photos of this journal here! you are brilliant, sincere, funny, honest, cute as a bug, hard-working, clever, authentic, optimistic, provider, happy person, encourager, painter of silver linings on clouds, athletic, wonderful father, loving husband, best friend, my sweet little dutch boy. and for these reasons, and millions more, i celebrate you...today, and every day!